Available within Connect, Interactivities allow students to experience and apply their understanding of psychology to the world with fun and stimulating activities. Coverage of career opportunities in lifespan development. “Connecting with Careers” inserts profiles of individuals whose career relates to the chapter's content. The Careers Appendix describes a number of careers in education/research, clinical/counseling, medical/nursing/physical, and family/relationships categories. Expert Consultants. Life-span development has become an enormous, complex field, and no single author, or even several authors, can possibly keep up with all of the rapidly changing content in the many periods and different areas of life-span development. With each edition, John Santrock seeks the input of leading experts about the content in a number of areas of development, who provide evaluations and recommendations in their area(s) of expertise. Proven Learning Goals Pedagogy. This class-tested hallmark of John Santrock's programs encompasses learning goals, chapter maps, review and reflect, and reach your learning goals sections, which are all linked together. By following this pedagogical road map, students will read and retain course material more effectively and efficiently. Connections between theory and applications. 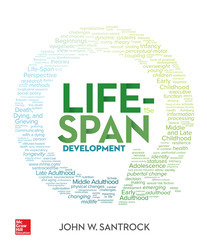 Santrock provides a wealth of applied examples to show students the personal meaning life-span development has for them. In addition to the narrative's applications, each chapter also boasts a “Connecting Development to Life” feature, which focus on health and well-being, parenting, and education. Developmental Connections in the margins link discussions of topics across chapters.